Well folks, would you look at this. The official Android Developers YouTube channel has now confirmed we will see Android 2.4 (or 4.0) Ice Cream Sandwich detailed at the CTIA Samsung Unpacked event next week. While this isn’t a big surprise seeing it from the official channel makes it even more official. We will be seeing the next Nexus and Ice Cream Sandwich next week, and we’ll be there live to bring you all the details. The Androiddevelopers channel has been bringing us Android related videos for a while now, and in case you don’t remember — that was where we all got our very first glimpse and tease of Android 3.0 Honeycomb. 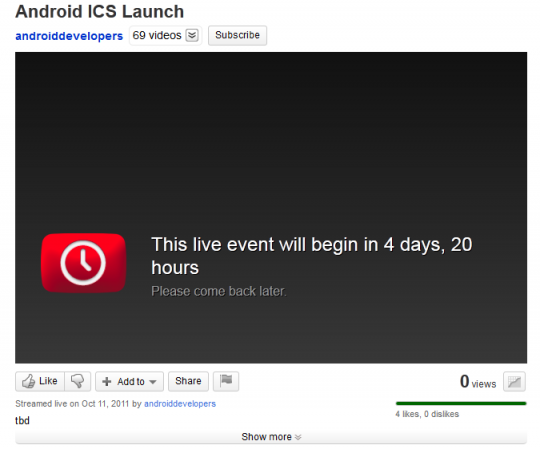 This is a sure sign that the Nexus and Ice Cream Sandwich will be unveiled in just 4 long days. At least those not there will be able to watch it live right? Sadly we all have another 4 days and 20 something odd hours to wait for the official details — in the mean time check out all these juicy Samsung Nexus rumors. Then check out this amazing render of the new Samsung Nexus Prime we just covered. Doesn’t it look beautiful? I have a feeling that might actually be pretty close to what we see come Tuesday. Either way I’m super excited about this event, who’s with me?